Mouth Off Monday: Is Data the ONLY Way to Prove We Are Effective? It's hard to believe it's that time of year again. 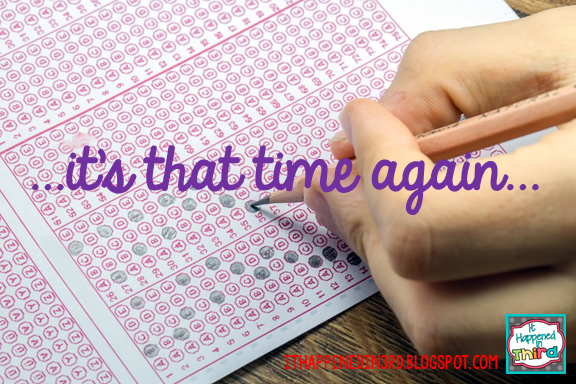 All educators have their opinions about standardized testing (and I'm sure you can guess what they are). The thing that has always baffled me the most is that based on my class's performance on one reading and one math exam people who have never entered my classroom are able to determine my "effectiveness" as a teacher! How do they accomplish this? Why, just look at the data! Does data serve a purpose? Sure. 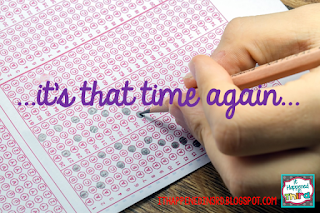 Can we use the data from standardized tests to better meet the needs of our students? Of course (provided we receive the data in a timely fashion, not six to eight months after the students take the test...but I digress). But do these tests REALLY tell us if we are "effective" or "highly effective?" A standardized test can show that Suzy got 8 out of 10 questions right in the cluster Key Ideas and Details. This tells me that Suzy paid attention during those lessons, or, more likely, that Suzy is at least an average reader with decent deductive reasoning skills. If you think about it, though, it really doesn't say anything about my effectiveness as a teacher. Maybe I taught Suzy about main idea, but is that really all there is to being an effective educator? 1) Your students walk out of your class happy every day. Do your students greet their parents with smiles, eagerly wanting to share the details of their day? Do they come up to you at carpool to ask you more about a lesson you taught that day, or just to share something that happened in class that they enjoyed? Have they ever told you they can't wait to come back tomorrow? If so, you are being highly effective. 2) You see evidence of growth in many different areas. Standardized tests measure one particular kind of growth. Highly effective educators know that growth occurs every day, in many different ways. You may have a student that can now write complete sentences without assistance who started the year writing only nonsense words. This student may still fail the end of year assessment, but you can't tell me he didn't grow as a learner. You may have another student who used to have complete meltdowns over the smallest things learn to go outside and count to ten when she gets mad. No standardized test will measure that, but it's definitely growth. Highly effective educators look for positive changes their students make every day, no matter how big or small. 3) You try to make each day memorable. This doesn't mean you have to turn your classroom into a replica of the solar system, or wear a funny hat every day. It just means look for those small moments that students will remember for years to come. My class last year isn't going to remember how many questions they got correct about Text Features, but they are going to remember going outside and singing to the trees in an effort to make the elusive "Lirfaloop" bird show his face on April 1st. My student this year won't know where he ranked on Measurement and Data but he will remember that I let him do the Worm on the way back to his seat after he asked me a question. It's highly effective to try to make every day as enjoyable as possible. 4) You allow your students to take ownership of the classroom. 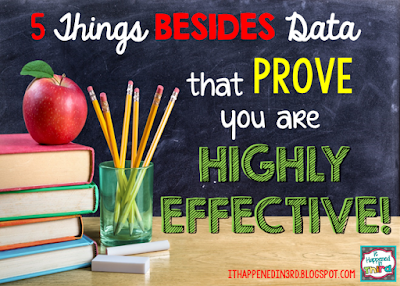 Highly effective teachers give the students the tools they need to take charge of their learning. Do you include student choice in your assignments? Can your students call a meeting to address an issue the whole class needs to talk about? Do you allow your students to vote on issues that affect the class? Do your students have the opportunity to share their learning with other classes or members of the community? These aren't things that can be measured on a test, but they are the things that make a classroom a memorable place. 5) Your students find their own little ways to show you they care. It may be a bear hug. It could be a note slipped on to your desk. You may be presented with a rock during recess. A student might apologize for being "a pain in the neck" that morning. Every day, you receive some token of appreciation from at least one of your students. Some may be easier to understand than others, but they are there if you look for them. When a child lets you know you are making a difference in his or her life, you are highly effective, no matter what some silly test may say. Got something you want to mouth off about? Share or link up in the comments! Evidence of growth in many ways i also agree is what counts. I'm so sick and tired of data and assessments. Can the kid read, follow directions, think, communicate thoughts orally or written? Are they actively involved and engaged in their learning? Can they problem solve and work collaboratively?